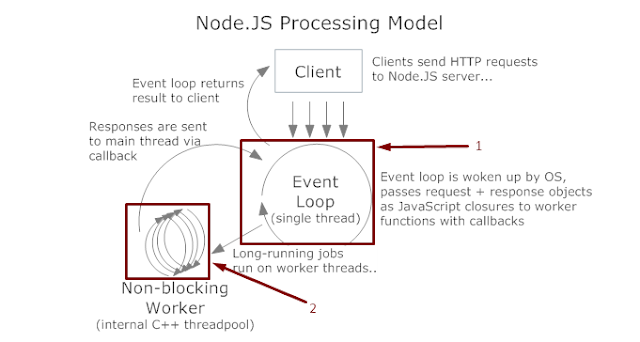 Node.js uses an event-driven, non-blocking I/O model that makes it lightweight and efficient. Node.js' package ecosystem, npm, is the largest ecosystem of open source libraries in the world. Node.js runs single-threaded, non-blocking, asynchronously programming, which is very memory efficient. We will see this in a moment. Server keeps a thread pool ready to server incoming client requests. As soon as a client request is received server takes one of the free threads and uses it to process the incoming request. This limits simultaneous client connections an server can have.Each thread will take up memory/RAM, processor/CPU eventually exhausting computational resources. Not to mention context switch happening. All of this limits the maximum connections and load a traditional server can take. This is where Node.js differs. 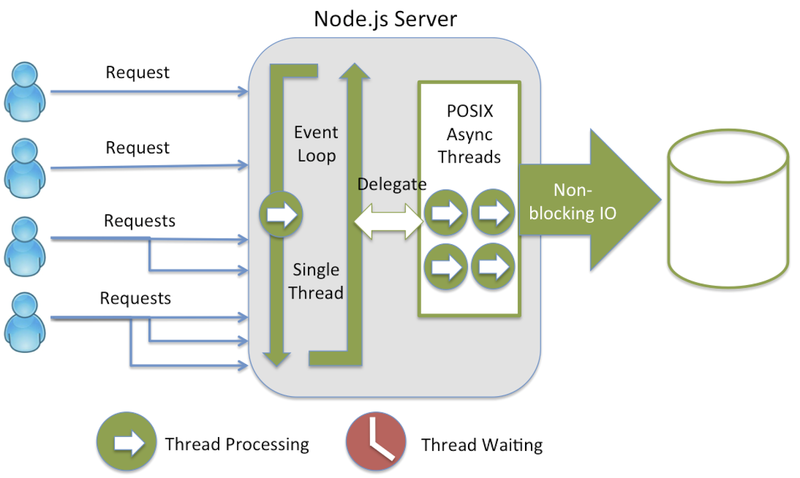 As mentioned before Node.js runs single-threaded, non-blocking, asynchronously programming, which is very memory efficient. So it's just a single thread handling client requests. Only difference is programming is asynchronous and non blocking event driven. So when a client request is received single server thread starts processing it asynchronously. Immediately it is ready to get next client request. When processing for 1st request will be over main thread will get a callback and result will be returned to the client. Aync tasks are done by worker threads. That being said Node.js is good for CPU intensive tasks given it is single threaded. So if your usecase is cpu intensive Node.js is probably not the way to go.